Managing an eCommerce site can be daunting, especially with the amount of projects that have the potential to increase site ROI. This is why I wanted to zero in and introduce 5 great ways to increase site and shopping cart conversion rate for your business.. Prior to co-founding TrustSpot, I spent a little over 10 years working within the eCommerce industry for various SMBs and even some enterprise companies such as The Home Depot. One aspect that never ceased to amaze me was how the same solutions that helped micro sized ecommerce sites, were also beneficial to larger ~ more enterprise based sites such as THD. When a new site visitor comes to your website, they have what we call “Stranger Danger”, where they have no clue about the reputation of your site / brand. All they know is that you provide a service and/or product that they are interested in learning more about. When site visitors come to your site, one of the first things most people tend to look for are indicators of trust – such as badges, reviews, verification symbols or even SSL certificate logos. With TrustSpot we make our Trust Badge available to all customers including our Free Plan to help you instill confidence into your site visitors that you are a trustworthy place to do business. By instilling more confidence into your customers, they feel better knowing you are a reliable and trustworthy shop and thus increase the likelihood of them completing a purchase. 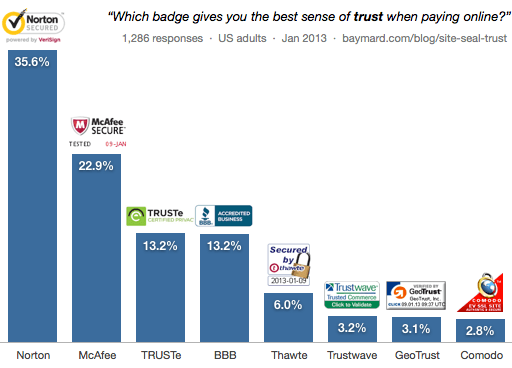 Baymard, a eCommerce consultant company completed a survey in 2013 which measured how site visitors respond to common trust symbols and how much they trust them. When it comes to the actual checkout process, you want to make the experience as seamless as possible for the user – which means you need to reduce the complexity of the form and make it extremely easy to complete payment. One great method which many sites talk about is utilizing Guest Checkout, where a user is not required to login to an account or even create an account at the time of purchase. Guest Checkout normally also keeps fields minimized because it doesn’t require entering in a username / password for account creation. This is why I would recommend to upsell the account creation aspect on the Thank you / Post-Checkout page. You can list the account creation piece as optional , and list a few ways why the account creation can help them in the future (faster checkout / saved CC for example). 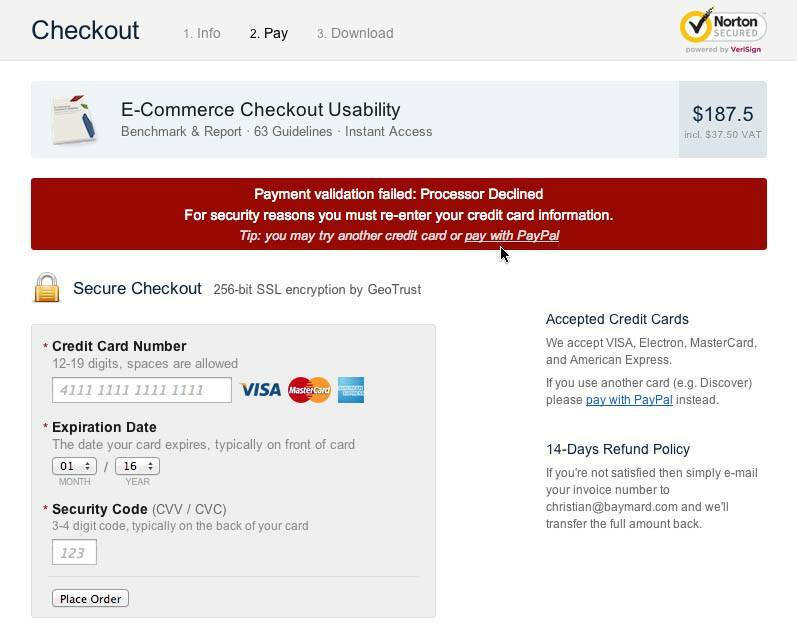 When customers make a purchase online through their preferred method, in this example a Credit Card, they may run into a problem where their card is declined. The user will likely attempt to re-enter their information and try again, however there can be the case where this off puts the user and they decide to leave instead (thinking maybe their card isn’t the problem, but the checkout form has an issue). Do not misstep if the customer makes personal attacks, uses profanity, or is providing non-constructive feedback. Be thoughtful of your online presence. In this screenshot example, the system is telling the user they can use an alternative payment option such as PayPal to complete their purchase. Similar to #2 with Guest Checkout , you should always be thinking of ways to minimize required fields by users on the checkout screen. The more complex a checkout screen is, the more it slows down the users and increases the likelihood they will abandon their purchase. When adding coupons to your cart, adding in a gift card, updating shipping information or even changing quantity; many eCommerce carts use an “Apply” button to complete the action. However, some carts instead utilize a technology called AJAX which allows the cart to refresh on the fly once a change has been applied, and thus no need for using an apply button. You always want to reduce the amount of clicks it takes a customer to complete their purchase, and this is an easy way to reduce a large chunk of extra unneeded clicks in your cart. This is one of my favorite projects that was successfully implemented at various sites, and has worked wonders in terms of reducing checkout complexity, ordering issues and improving customer satisfaction. Address Auto-Complete and Suggestion is a method in which helps the user identify their street address as they type characters in the form field. Similar to how when you go to Google.com and type in a term to search, Google will attempt to guess what you’re trying to search for and offer you suggestions. The same concept works for online checkout, where the system will attempt to guess the customer’s address as they type into your site. Two of my favorite companies that do this are: Google, and SmartyStreets.